Germany's exporters enjoyed another month of growth in February. The latest figures showed exports were up 1.6% over the month, following a 3.4% increase in January. 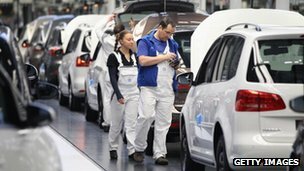 German firms had the most success in markets outside the eurozone where they recorded growth of 13.4% compared with the year before. But the nation's trade surplus shrank to 13.6bn euros ($17.8bn; £11.2bn) in February from 15.1bn euros in January as imports grew strongly at 3.9%. "German exports defied the general February freeze of the economy and increased for the second consecutive month," said Carsten Brzeski an economist at ING Bank. "Last week's industrial data showed that the German economy is still flirting with a technical recession. "More and more, the German economy's destiny is in the hands of its trading partners outside the eurozone," he added. Last week figures showed that German industrial production fell 1.3% in February, compared with the previous month. The fall was partly blamed on bad weather which hit the construction industry.